Not only at home but also during family trips in the nature you will appreciate our sweatshirts, thanks to which you and your child will stay warm. 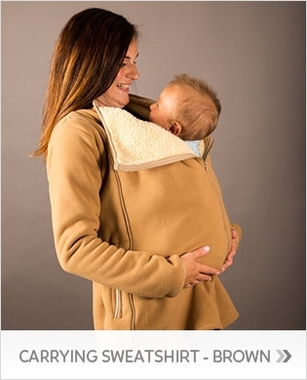 In comparison with the baby carriage, carrying sweatshirts have a great advantage by allowing you to stay in close contact with your baby all the time. Baby stays comfortably in warm and can happily observe the surrounding word. 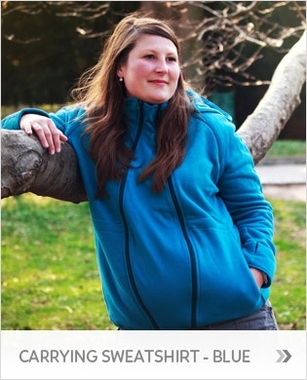 Our sweatshirts can be used for front and back carrying. They are made of fleece, which is very soft and comfortable material. 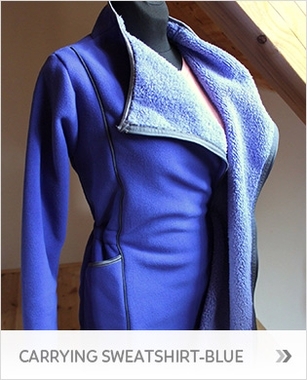 Combined with the jacket or coat, can be used even in the winter months (it has been tested in -10°C). This multipurpose sweatshirt is produced from very warmth-keeping material - cotton french terry fabric (100% cotton, 315g/m2). It has a lot of clever features for comfortable wearing. Detachable sleeves enable to easily covert it to lighter version, a waistcoat. 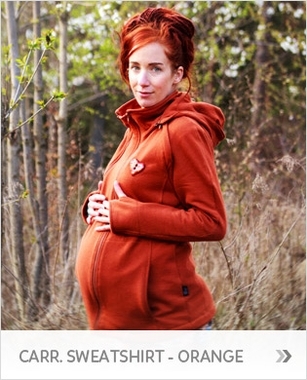 Sweatshirt can be regulated in the waist and in the bottom. Pregnancy and carrying inserts are made of double layer cottonand the later one isadjustable at the top.